Raise your bass weapons and arm yourself for the zombie neuro apocalypse! Infektion delivers a raw fusion between neuro and high octane dancefloor dnb. Expect the highest quality source loops and samples, which have been waiting to fall into your creative hands! Featuring an earth-shattering sound library with a tinge of dirty funk. If you’re a fan of artists like Noisia, The Upbeats, Phace & Misanthrope, Teddy Killerz, Signal and Synergy, prepare yourselves for skull-smashing beats and breathtaking basslines and get ready for a neural invasion with one of the most outstanding drum & bass sample packs we ever released! 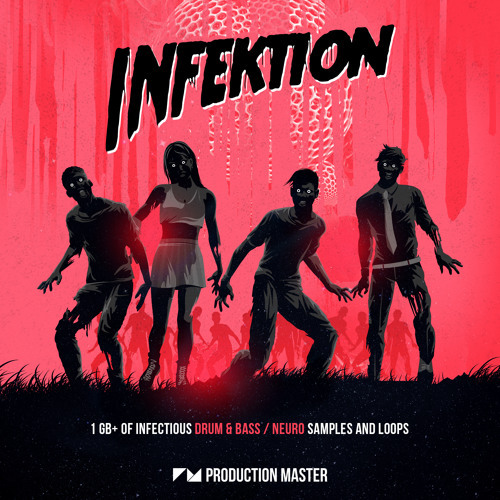 ‘Infektion’ features an advanced arsenal of tools that will ravage the dancefloor and give your neurofunk productions a serious edge. Inside you will find a plethora of industrial breaks, boomy kicks, crazy percussions, crisp hi-hats, thundering snares and way more! Find raging beat loops with triplet swing, straight stepping dnb mayhem and feast on the twisted, percussive neurofunk, jump-up and dancefloor madness! Get ready for cone-tearing mid range screamers and colossal sub growlers with modulated textures that will blast through the walls of your studio. The bass sounds in this collection ride that fine line between the iron-chomping neurofunk and modern stomper jump-up, making them suited for just that style that is tearing up dancefoors right now. If you’re after dystopian leads with that essential funk feel, look no further! This collection includes a huge amount of psycho-sounding arps, bleeps and leads that carry that typical new era neurofunk sound. Feel free to decide between heavily processed samples or go for the more natural and warm tones. With this folder, finding the right mood for your track is just a breeze. Explore the aura of creepy apocalyptic sounds with our FX folder! Add these tension-wrenching effects as an extra layer to enhance your creation and inject new life into your sound. What are you waiting for? Create some serious flesh melting drum & bass! Grab ’Infektion’ NOW!